Here we are in Crescent City, California, not far from Redwood National Park, and I have lost all interest in it. I know what’s wrong with me. This summer has been rich, full of new places, people, and experiences. We’ve traveled hundreds of miles, and we’ve played tourist all over. Now I need to hide out somewhere with my crew. A person can only stand so much fun. Instead of delving deeper into California with its expensive gas and pricey, coastal campgrounds, I turn us northeast on Highway 199. Soon I see redwoods for the first time! Of course, I’m awed but not enough to find a place to stop. The view from the road satisfies my need to see redwoods . . . The crew and I are on our way to Panther Flat. 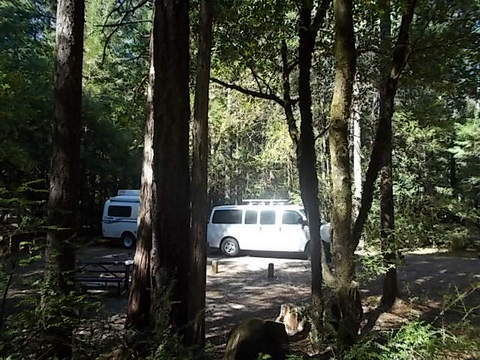 It’s a national forest campground less than twenty miles from Crescent City and situated on the Middle Fork of the Smith River. We pull up to the self-pay station. Good! It’s only $15 a night regular, so we only pay $7.50 with the Senior Pass. This is more our speed. It’s a pretty campground shaded by Douglas fir, cedars, and several other types of evergreens. I search for a sunny campsite. Ah-hah! This confirms my theory! I might upgrade this theory to law status. RVsue’s Shady Campground Law or something. Darn it! I park the Best Little Trailer and the Perfect Tow Vehicle in a shady site with occasional sunshine. Well, there’s no internet connection here anyway, so I won’t be concerned with keeping the laptop charged up. The batteries are charged up now. Tomorrow I’ll park the PTV in the day use area for a while and get some sunshine on the panel. I like that. 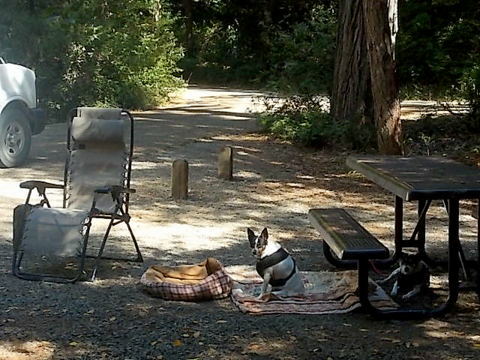 Bridget and Spike can hang around the campsite off-leash and nobody cares. I can coccoon without being expected to socialize. 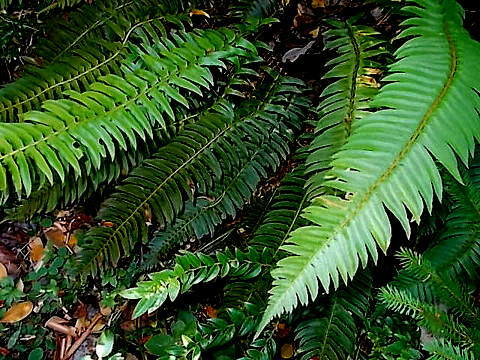 An abundant variety of plants and trees make for interesting walks. We’re at about 500 feet altitude and the temperature is perfect. We make our nightly walk down to the day use area which is next to the river. However, to get close enough to get a photo of the river requires climbing over rocks. Bridget’s tired of hopping on three legs, so I put her in the stroller for the walk home. I haven’t yet brought the blog up to real time. However, I know some of my readers are interested how Bridget’s leg is doing, so I’m moving forward in time to the present to report on the situation. Bridget has a “partially torn cranial cruciate ligament.” The vet advises surgery to stabilize the knee, even though the tear often resolves itself in small dogs. The vet advises the surgery be done within a month. She writes a prescription for 28 anti-pain/anti-inflammatory pills for Bridget to take once a day. The bill for the exam is $42 and the pills are $22.68. The cost of the surgery is estimated at $1,000. Ouch! That’s a lotta tires. This entry was posted in Simple living and tagged California, camping, Crescent City, knee injury, ligament, National Forest, nature, Panther Flat, Senior Pass, Smith River. Bookmark the permalink. G’evening Sue. I’m a newbie follower, but couldn’t let your reference to Bridget go unspoken! My Caraleigh was given the same diagnosis a few years ago (at 9 y/o) … but we didn’t have the ready funds for surgery … and thoroughly disliked the after-care regime of keeping her crated. We waited and prayed … and gave her baby Benedryl. Not certain how or why, but 3 months later her leg was perfectly normal. Even at 12 y/o, she clammers around like a pup, albeit more slowly … but there’s NO sign of a limp or disfigurement. I’m not suggesting she hasn’t injured her leg, but wonder if a second opinion isn’t an option. Caraleigh n’ I are both sending healing thoughts to Bridget! Hello, Myra . . . There are so many variables to consider in this situation. Every dog is different, every injury is different. . . The vet says the injury is not fully understood until the dog is sedated and a more thorough exam can be made. That may be why your dog healed up, whereas others won’t without surgery. It’s so confusing! Right now it looks like no bones were fractured or broken. Thanks for the good wishes. Very sorry to hear about Bridget’s diagnosis… my Violet has had several broken legs- now sporting titanium rods for stability and doing great! The cost was up there.. but then again- she is family to me.. as I bet Bridget is to you. The love and comfort they give is worth every $$ to me.. and a great bargain all things considered… Our best wishes to you! SJ, Violet and Music too! Thanks, Sally. Whoa… I hate to think how much those leg rods cost! Chino (our puppy) now 1 year and 3 months old had to have surgery on both her front legs and while it was costly, but well worth it. She was only about 9 months old when she had it. It is especially hard on a tight budget and you have to figure out what to give up for the surgery. I am new to your site and really enjoy reading about your travels. I’m glad Chino’s surgeries went well. Welcome to my blog! YIKES!!! Poor Bridget!!! But I think I would opt for a second opinion before choosing surgery! Looks like a great campground! 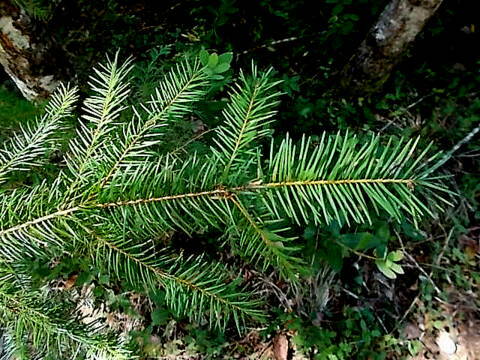 I have never seen a redwood tree. Too bad they are only in California… I have NO desire to visit that state at all! But where you are/were Panther Flats, looks soooo nice! My research on the injury confirms the need for surgery. Since I don’t plan on using the same vet clinic, I’ll automatically get a second opinion. More on all that in a future post. I got a glimpse as I was on the super highway of California ocean, beautiful blue, no fog… still need to hide in the forest for a bit. awwwww, so sorry I teased you Bridget! Sue, please give her a gentle but loving hug from us! HoundHerd sends lots of licks and tail wags! Earthdancer, before you prejudge California, you should give the state a chance. Yes, it is an expensive place in which to travel and the roads could be better and it can be crowded; however, I can’t think of another state that has more diversity in landscape, scenery and beauty on such a grand scale. If nothing else, Yosemite Valley is worth your time to visit. Although I live in a beautiful state, Colorado, I have always found the variety of spectacular scenic attractions of California worth the visit. Check out vet schools. Our Daisy had to have surgery and it was almost half of what an orthopedic vet would charge would have been. And, she had exceptional care. We had her surgery done at Oklahoma State University. They are absolutely awesome. I know you are no where near OSU but I am sure that If you will check with a vet school you will be very pleased. I’ve located another vet practice that’s recommended by locals and is reasonable, plus there’s an inexpensive place for us to camp during her recovery period. Good to hear there is a better option. I just hate when Daisy’s bad hips act up and she is gimpy for a few days until her meds take effect. I am sure that you are ready to get her all fixed up and back to normal. I hope all goes well and that her surgery is successful. Without surgery, the tear could heal up but there’s also the possibility of the tear worsening. Also longterm degeneration… osteoarthritis. Sure, she’d survive without surgery, but she’d probably limp and have pain. I’m staying away from California campgrounds, heading back to Oregon. I wasn’t kidding about hauling that zucchini back to Oregon! Sue, Be careful on the timing of your return to Az for winter! You will have mountain passes to go thru and they do get a lot of snow. Thanks, Joan. Those mountain passes and the possibility of an early storm are a part of my planning. Once this surgery is over, the crew and I will make our move south and east to AZ. Well, not the great news I was hoping for with Bridget, but at least you know you can have it fixed. The vet prices are no where near as high as they are in Georgia. You don’t want to know the vet bills I had for Jack in 2011, but they saved his life, and that’s all I care about. He was in no pain (had no symptoms at all), but wasn’t going to survive unless he had surgery. Lizzie, on the other hand, there was no hope and only pain in her future, so I put her to rest. Still cry when I say her name. Glad your weather is good. I don’t particularly care for the parts of California I’ve seen except for along 101 and the headlands up by San Francisco–oh, and over from Nevada (see, shouldn’t make blanket statements), and I’m becoming more convinced that the time to visit the Oregon Coast is in the fall–I’d even love to spend a winter. We are different, I know. I like to get away where it’s only Jack and me, too. He loves to swim so the lakes and streams in the west were great for him. In the east–well, I don’t like the lakes in the southeast–I worry about snapping turtles and such. I wonder if a small 1000 Honda generator (very, very quiet) might be something to have on board. A little under 30 lbs. http://tinyurl.com/9oen2tw It would be enough to power up your batteries and laptop, etc. My plans for the future were to have a combination of solar and generator so I bought a Honda 2000 thinking I’d get out, again, to run when solar failed. The difference is I could keep the generator in the truck–I don’t know where you would put one. Well, kisses and hugs to Spikey and Miss Bridget. I hope her condition clears up without surgery. Maybe you’ll get lucky. Thanks for the URL. I would like to see if I can live without a generator. So far it hasn’t been necessary. I believe there are some readers who would like to live generator-free, too… so my life is an experiment! We had the same surgery for our dog. Our vet said the same thing about it may heal on it’s own. She had problems with that leg the rest of her life. I always wondered how she would have been without surgery. Oh dear, I hope the problems she had weren’t painful. I would guess your dog would’ve been worse off without the surgery. I was afraid that might be the diagnosis. The same thing happened to my little terrier in the same way it happened to Bridget. Poor baby. I understand exactly what you mean. Sometimes it’s enough to admire nature’s bounty from behind the steering wheel, doggone it. Then you start to feel guilty for not stopping to ooh and ahh. But then you realize that’s silly and the only expectations you have to meet are your own. Hi, Kim . . . Nice to hear someone understands my drive-by! Hi Sue, I haven’t written in a while but I still follow daily(though often you’re not there :). I’ve been to Panther Flats and thought it would be a nice place to camp. I think it’s empty because all the other campers are on the coast enjoying the fog. I’m sorry about your timing on the Oregon coast. I stayed there(Washborne and Cape Blanco) in July and they were both wonderful. If real estate is location, location, location then camping is timing, timing, you get it. I’m saddened by the Briget story. I’m so attached to my dog. But when our pets need healthcare it seems impossibly expensive. I sometimes think pet healthcare pricing feeds on our devotion. As an aside, in our ten weeks of summer camping we spent enough time in Oregon to decide to move there. We’re selling our home in Phoenix and moving in spring. My best to you and Briget and Spike. So nice to hear from you again, Ed! And congratulations on your decision to move to Oregon. It’s a gorgeous state. I think I’d want to move to an inland location, but obviously a lot of people love living on the coast. I love all the rivers and lakes… not to mention the forests! Such beauty everywhere! Good for you. I wish you the best. Hi Sue……………..sorry about Brigit’s leg and ? the need for surgery. We always want to do the best for our animals regardless of the price. It is hard to know what to do and a second opinion is a must. My daughters little Maltese x tore her achilles and the vet said surgery was needed to fix it, but they left it to see how it would heal by itself over a couple of months and she healed fine with no apparent limp or pain. I took our dear Lahsa Apso to the vet after she fell off a wall and ? injured her back. Vet I took her to diagnosed advanced arthritis and talked me into an exepnsive regime of injections with no improvement. Took her to another vet and he xrayed and what do you know a damaged disc. He also recommended surgery which we declined and she healed eventually but always had a stiff back and hips. I love the pusher to push brigit around………..I had the same for Brandy in her latter years….worked a treat and she loved going for her walks!!! Glenda. Oh, your comment brings up a lot of doubt. I’m curious what the second vet comes up with. I’ll let you know. So sorry Bridget needs surgery, but figured it was not going to be a good prognosis as she was still limping. Good to know she will have some pain pills. Now you don’t have to worry about whether she is in pain or now. Hope you enjoy your new campsite. I should have mentioned in my blog that Bridget has been on pain medication from the start. I wouldn’t have waited this long if she were in pain. I had a supply of meds for her and was down to the last pill when I got to a place where I could take her in to a vet. Poor Boo Boo Bridgit, so sorry you are still not feeling well. Sue would they be able to put a brace on that leg for more support untill it heals? I think using the stroller every time you want to take her out is the best way to go. Hope you find a good second opinion. Sounds like you all could use some down time at a nice quiet place for a bit. Hoping for the best. A brace wasn’t mentioned. I suppose it would cause problems, such as squatting to urinate, trying to sleep comfortably, etc. The stroller is a great idea… (Thanks, Elizabeth, for the suggestion!). Yes, I’m enjoying the down time. Poor Bridget…………such sad eyes….we know girl! Mom’s gonna do her best! Definitely get 2 maybe 3 opinion. Surgery to stabilize the knee doesn’t sound right…especially if the partial tear may resolve itself. With rest and anti inflams….surgery may not be needed. You said it yourself..then why have surgery?? Because vets are a “business” and surgery is money…lots of it. I would weigh the pros and cons. How sucessful is the surgery? Are there any forseen complications NOT related to the anesthesia? Is Bridget in pain now? Bridget continues to only use three legs…and not put weight on the injured..will this help in the healing process? And what time frame are they saying to “have” surgery? Is that time frame…long enough to see if it will actually resolve itself? There are also suppliments like Cosequin for dogs/cats that has glucosamine chrondrotin in it. All excellent questions that I’m considering. The concern for the partial tear worsening is that one time Bridget jumps off the bed or out the door or leaps up quickly at a noise and … bingo… Thanks for the link and for caring. Mi-Ah, my Shar-Pei (as I told you a few weeks ago), had ACL, TWICE, once on each leg, the surgery was great for her, she was in a crate for 4 weeks after surgery, but honestly everything went really great and now she is like a puppy playing, this was 3 years ago, at a vet in Tyler, Texas, Dr Ballou, he was FANTASTIC..Sending you and Bridgett possitive thoughts on the surgery. Thanks, Barbara. It’s great to hear Mi-Ah is back to normal and enjoying life. I like that spot you found among the trees. I know it’s not good for solar, but it sure is pretty. Ahh poor Bridget. I hope another vet gives you better news and she won’t have to have surgery. My son’s dog (huge dog) had hip dysplasia and had hip replacement surgery. Very very expensive and I don’t know that it helped him all that much. He still limps badly. But maybe it prevented him from being in pain, I don’t know. It’s so difficult to know if our decisions for our pets are/were the right ones. Panther Flat Campground is very nice. The crew and I enjoy walking through the trees(shady, mossy, ferns all around) on the many winding paths through the campground. I hope Bridget’s outcome, from whatever you choose for her, is good. She looks so sad in the stroller, as if she wished we wouldn’t stare at her. I am also so sorry to see so many negative responses to California. it is a state full of unique beauty and great folks. I hope to see that unique beauty someday. I’m sure there are many people ready to say positive things about California. My post elicited the not-so-positive comments about the state, all of which are true. I’m sure no one is disparaging Californians. It’s just that people living on the cheap like I do are a bit intimidated. Thanks for the kind comment for Bridget. My border collie ruptured her ACL about 7 years ago, and had the TPLO surgery. The recovery period was long but she did very well, and she is just now showing signs of arthritis at 14 years old. I have given her glucosamine/chrondrotin twice a day since the surgery – and I think that is extremely important! I bought a ramp so she would not have to jump in and out of my SUV (she weighs about 55 lbs. and I can’t pick her up). I also just saw the web site cinandjules posted where it is suggested to wait 8 weeks for signs of improvement – something to think about. Good luck with whatever you decide to do. I’m sure Bridget will be just fine. Good to hear the success of your border collie’s surgery. I’m going to ask about the “surgery within one month” advice of the first vet. Thanks for the good wishes. I feel the same way about just having to get away from too much………I once lived in California for several years and it really was too much. Out in the forest alone just calms the soul. My best wishes to you Bridget. It’s tough decision Sue is making for you but you know she will do her very best. Even a great actress doesn’t want to be in a stroller for the rest of her life. On behalf of the Boo-Boo Honey Badger, thank you! “Shut down” is exactly what happens with me, too! I can be excited about seeing new places and people and then, click! I’m Not In The Mood. You are in my old neck of the woods. Love Panther Creek and the Smith River. I used a vet in Cave Junction, north a ways, many years ago and thought they were reasonably priced and honest. Plus there’s a sweet forest camp, if still open, up Caves Highway. The Siskyou NF is so diverse although no redwoods, or much battery charging. You’ve been on the roll a lot this summer and can certainly understand wanting to hunker in for a quiet bit. Hope all works out with Bridget. It’s nice to know my “hunkering” is understood. I also think my concern for Bridget has pulled me out of sightseeing mode. I’m really enjoying a new forest camp I’ll be writing about soon. It’s a forest paradise. Hi Pam… The challenge in a situation such as ours is finding a good vet that’s within a reasonable driving distance from a camp that’s not too expensive in case there’s a need to hang around after the surgery. I’m working on that combination today. I love being alone in the woods next to a river with my two best pals. It’s like vitamins for the soul! “I can coccoon without being expected to socialize.”. Very well said. I’m glad it’s Monday morning, hubby off to work, and I can do the same. It’s vital to my sanity. Give Bridget a belly rub for me. We all need time and space to recharge. I’m glad you have the chance, Susie. So sorry to hear that Bridget-Badger is in need of surgery. But at least with surgery, you know that the tear will be fixed & she will get back to normal. Without surgery, there is a large chance of more injury & pain. Best wishes to B-B! You explained the situation very well, CT. I’ll verify with the next vet, but I suspect the advice will be the same. On behalf of Honey Badger… thanks! We understand your need to slow down. We are headed back to TX to rest up for the winter so that we can explore again next spring. So sorry to hear about Bridget. We all know that pets can be expensive at times, but they are so worth it. We are praying that you can figure out the best solution and that she is back to normal soon. Also, I like the idea of getting another opinion. Maybe one of your readers has a trusted veterinarian to recommend. Hi, Roger… Nice to hear from you again. I’m going by the recommendation of people in the area we’re presently in. I’ve found a reasonable camp I’m loving and fortunately there’s a vet clinic that has a good reputation from what I can gather. Oregon is a treasure, isn’t it. I love water, and water seems to be everwhere… lakes, rivers, little creeks, waterfalls, and, of course, the ocean. I’m happy you’re enjoying the state. Hi Sue, I’ve never commented before but felt the need. Regarding Bridget’s injury the answer is simple. The knee is either stable or not. Ligaments don’t regenerate or grow back. Without stabilization the knee will become more and more painful with arthritis. This is a subject very near and dear to my heart since my corgi had the same injury. My mobile lifestyle at the time was perfect for his recovery and rehabilitation since the first three months after surgery is critical. Yes, you heard that right, three months! On the leash at all times, except for potty walks. Living in the RV made containment easy. Only issue I had was to keep him from jumping onto the sofa. So we improvised a ramp and mandatorily enforced it’s use. Treats really helped in that! No corgi can resist treats. Rehab is more important, done right and not rushed. Just like with us! Weight management is important. Timmy is a corgi and makes that critical, since corgis dwarfism and anatomy don’t do well with ANY extra weight. Any person having had a ruptured ACL (CCL in dogs) can tell you how painful it is. Every step is a nightmare. Only reinforcing the knee with one of the several surgical options is the answer. Timmy is now back to 100% corgi. He does take several supplements every day and no one except me knows he had the surgery. Good luck in your search to find a solution. I don’t have to tell you to not believe everything you read on the Internet. For more information, I suggest the Yahoo group called “orthodogs”. Excellent resource, and filled with wonderful caring people who have been there, done that and are now wearing the t-shirt. Hi, Sylvia… You reiterated a lot of what the vet told me. There will be physical therapy afterward. You’re right, travel is good for the healing time. Bridget and Spike are immobile while we’re on the road. There isn’t room for a ramp inside the BLT. However, already Bridget stands ready to jump down off the bed and waits for me to lift her down… She’s a very accomodating little girl, always looking at me to figure out what I want her to do. If this injury happened to Spike and he had the surgery, I don’t know how I’d get him through the recovery time… He’s so obstinate and unpredictable! Thanks for following my blog and for taking the time to write me. Best wishes to you and your Timmy. Hi Sue – Haven’t been on the net much, but have been hoping all’s well. My experience says Slyvia is right, but I know you’ll do whatever is best for Bridgett. The recovery really isn’t that hard and goes fast, and with a small dog like her, it’s easier – mine were larger and hard to lift, and yet we still did fine. All my best and safe travels! So sorry about Bridget. Sylvia is right. It is very important to have this surgery. Our Tara has had it done on BOTH rear legs – 3 months recuperation and then rehab both times. Very expensive -$2500 each time so $1000 sounds very reasonable to us. 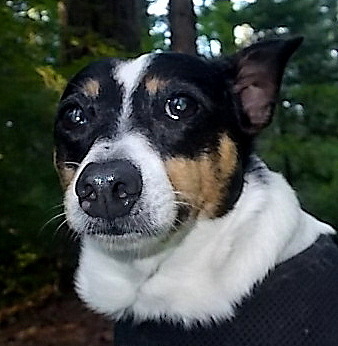 You can read about her experience here http://theaccidentalrvers.blogspot.ca/search/label/Pets%20and%20rving. Scroll down to Tara’s story. Her legs are fine now, thank heavens, as she really needs them for support as she has severe arthritis in her right front leg now. We wish Bridget and you all the best as you work your way through this. And, the stroller is a brilliant idea. The brilliant stroller idea came from reader, Elizabeth. Wow! You’ve had a time of it! I’m happy to know Tara’s legs are fine. Thanks for the best wish. I was afraid that might be Bridget’s problem when you described her injury. We had that surgery done on an eleven year old dog and she lived a healthy and pain free life for another six years. P.S. we really couldn’t afford it at the time but we dug deep and got ‘er done. No regrets. Hello, Ruth… Nice to hear from you. I appreciate hearing a success story with this possible and probable surgery for the Bridge. I’m glad you took Bridget to the vet to find out what was wrong with her. I would echo others about getting a second opinion, but I also think it might be the case to have the surgery done. You don’t want to hamper her living a full and happy life, which I know you don’t want to do. I’m enjoying the pictures and stories about your travels. I went to a big RV show last weekend, so now I’ve got some real-time knowledge of various rigs and costs. My main choice is going to be whether I get a trailer and a tow vehicle or a self-contained Class B or C.
Hello, Cari . . . As you probably have already figured out, the key to choosing the right rig is knowing how you will use it and where you want to take it. When I see a Class B I think “Hmm, like to sightsee, park in town, move around a lot.” Remember with a Class C, although they are very nice, you’ll have to take your home with you whenever you need to go somewhere (securing everything, taking up the water hose, etc. ), and what you leave behind will be exposed. As you can tell, I love the trailer/tow vehicle set-up! It suits the way I live. That’s what’s important. Good luck! Hi Sue, Been a while since I’ve commented but I ALWAYS read your updates.. I indeed feel your pain about needing to coccoon, I am a computer network engineer and need the “down time” more and more every month 🙂 . As for Bridgett and her leg,, we have a Boxer, “Tank”, a big strong boy that is named that for a reason 🙂 . He had the same injury on not one but BOTH his back legs, we elected to spend the $$ on the worst one and now wish we’d let him heal on his own.. The leg we let heal is doing great, but the one that had surgery never gets used 😦 . He has adjusted to the three legged run, and on good days (or when no-one is looking) does use the bad leg, but for the most part keeps it pulled up and refuses to bear weight.. We LOVE our animals and they get treatment even when the cupboards could stand re-stocking, so it REALLY pains us to think of our “kids” being in pain!! As a thought before having the surgery, I would look into some warm water swimming therapy where she could get some movement exercise on that leg without much weight bearing? Besides she looks so darn’d cute in her life jacket 🙂 Tell her (and Spike) hi from the gang in Iowa, and we will look forward to hearing how she progresses..
Ol’ Tank has put you through the leg injury crisis, doubled. Were you given physical therapy exercises for the recovery time? I wish we had easy access to warm water… Right now the river we are camped along is water from melted snow and ice! The surgery for Bridget has not been scheduled yet. The vet says it’s okay for her to have this time on meds as long as she doesn’t hop around and gets plenty of rest. Yes, I agree… Bridget is a doll in her red PDF! Thank you for being a loyal reader, Larry. There was a lot of manual manipulation and stretching after the surgery but during recovery from the original tear the vet just wanted him to get rest and keep him as quiet as we could, yea right!!! I really think the more she rests the leg the more she will improve but I still believe in “some” exercise is needed to keep the muscles from atrophying, just no running and bouncing around…. Pray for the best for you guys in what ever decision you make. I just read your last post about camping by the river, WOW what a glorious place you’ve found again… Happy Trails!! I’ve entered a comment but don’t see it… I have a terrible time commenting on WordPress blogs from my iPhone. Finally got to wifi. Just wanted to say that yes … I understand totally about cacooning…. and so sorry about Bridget. I’m in Forest Grove right now … hope you do make it back to Oregon … would love to catch up with you. I think $1000 would be quite reasonable. I paid $1500 for my dog for the ACL surgery. I agree with another comment that tendons don’t heal very well naturally and she would always be favoring that leg if she didn’t have the surgery. I also had to do a lot of lifting after surgery with Gretta because she always wanted to be by my side or on my bed. I enjoy reading your blog so much to the point you are my number one read in the morning. I hope you don’t mind us voyeurs from afar. Safe travels! Hey, Gene! Glad to have you with us! Thanks for the great compliment. Other than a miraculous healing, it looks like Bridget will have to go for the operation. So sorry to hear of Bridgette’s problems (I’ve been out of town, just returned). It’s hard to see them hurt. We had Killer’s surgery this past year, his was $700 but worth every penny. He had a mole and we were afraid it was cancerous – the vet said it had a long tail on it. Long story short is that he’s doing good but more moles have appeared. Hoping and praying that they aren’t anything bad…vet is keeping an eye on them. Praying for sweet Bridgette and u and Spike. Thx again for letting us “ride” along…I really enjoy the posts and love the Canine Corner.